When you are done adding, hit this button. Scroll down and hit the blue button when. Ready to send request for new invoice with. How to get the invoice when you buy more than one item The item in the photo is the exact item you will receive. ET 1 SERIE COURTE DE LA REPUBLIQUE SOCIALISTE DU VIETNAM. TIMBRES VIETNAM. 40 TIMBRES. Parti Démocratique. Vietnam indépendant, 1952, Stanley Gibbons # 88 neuf sans charnière, carnet complet de 20 timbres. = MNH = neuf sans charnière / mint never hinged. = MH = neuf avec charnière / mint hinged. ST = standard / average. Timbres de Annam et Tonkin neufs et oblitérés. timbres de Annam et Tonkin de très bonne qualité. timbres Annam et Tonkin garantis par nos experts. type Alphée Dubois. timbres type Alphée Dubois de 1881 surchargés. Timbre de Annam et Tonkin neuf avec charnière. timbre de Annam et Tonkin de très bonne qualité. timbre Annam et Tonkin garanti par nos experts. timbre type Paix 1 sur 2c lilas brun. timbre garanti authentique. South Vietnam, 1960 - 1961, Stanley Gibbons # S103 / S118 - S120 / S125 - S130 / S141 - S142 / S160 mint MNH. Beautiful set with only complete sets. Sud Vietnam, 1960 - 1961, Stanley Gibbons # S103 / S118 - S120 / S125 - S130 / S141 - S142 / S160 neufs sans charnière. Vietnam, 1989-2010, Stanley Gibbons, # 1290 / 1096 (complete) - 1411 / 1416 (complete) - 1628 / 1634 (complete) - 1741 / 1746 (complete) - 1990 / 1995 (complete) - 2105 / 2108 (complete) - 2616 / 2619 (complete) - 2772 - 2773 - 2812 / 2814 (complete) mint MNH, Blocks, # MS1297 - MS1996 - MS2620 - MS2815 mint MNH, XF. North Vietnam, 1945, Stanley Gibbons # 3b unused ( ), printed without gum, variety : without « C » at the end of « HANH PHUC » in the overprint. = MH = neuf avec charnière / mint hinged. = MNH = neuf sans charnière / mint never hinged. TB = VF = très bon / very fine. B = F = bon / fine. ST = standard / average. O = oblitéré / used. = MNH = neuf sans charnière / mint never hinged. = MH = neuf avec charnière / mint hinged. VIETNAM NORD Effigie d' HÔ CHI MINH 1949. 65a,65b,66 VIETNAM NORD Effigie d' HÔ CHI MINH 1951. COMMIT TO BUY & SUMMIT REQUEST. Ready to send request for new invoice with. Scroll down and hit the blue button when. When you are done adding, hit this button. Vietnam 1984 - Soviet Union-Vietnamese Projects / Scott 1361 Color Trial Proof. North Vietnam, 1956, Stanley Gibbons # N47 unused ( ), printed without gum, red overprint in the bottom right corner. With a certificate. Avec un certificat fourni. B = F = bon / fine. ST = standard / average. INDOCHINE N°261/273( ) série des Marins (non inclus 263A & 270A), 13 valeurs,1943-1945 French Indochina set NGAI. 47000A gen. Verdoux Philatélie. 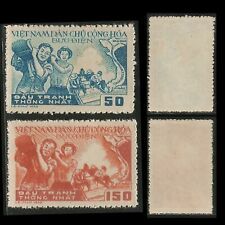 Vietnam, Sc.#1218-19, Environment set of 2, imperf. essay proof on wasted paper.